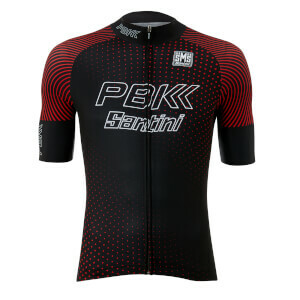 The PBK Santini Karma Team Bib Shorts are made of Lycra Thunderbike that provides a light graduated compression and excellent abrasion resistance. Anatomical cut to always guarantee maximum comfort and elastic shaped grippers with non-slip grip on the legs. Breathable mesh braces and new anti-shock MAX chamois pad for incredible performance, even over long distances. Perfect together with the Karma jersey, they are versatile and easy to match to any jersey in the collection. I like Santini products and bought these on a whim. TBH I wish I'd spent a bit more and gone for a pair with a git chamois. 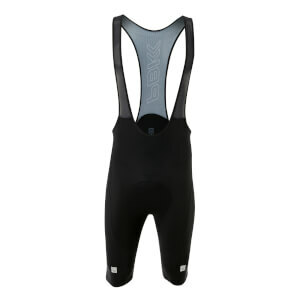 The bib itself is good, the saving comes in the one piece chamois. 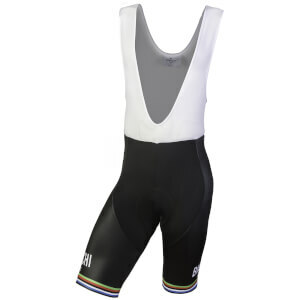 For that price I could have found some castelli bibs with a kiss pad. The problem there would have been I find their low end products wear thin quickly, although the pad lasts longer. I'll only wear these for rides up to 50 miles and on my indoor trainer. 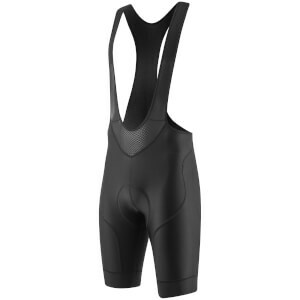 Brought these just to try out as I have had other Santini knicks and really liked them. I didn't have any great expectations given that they were not the top of the line kit but was really surprised at the quality of the Lycra and the chamois. They fit so nicely and are just super comfortable. I liked them so much I purchased a second set a few weeks late. A great buy from both a cost/value perspective and a performance perspective. Very comfy compression w/o restriction. First off, these are my FIRST nice pair of bibs I've EVER worn. I've ridden for years but always just used cheap bibs/shorts. WOW. what a difference nice bibs make. I researched for probably 3 weeks before pulling the trigger on these. I was planning on getting the "PBK Santini Tono Race Bibs" for just slightly more money than these Karma bibs, the Tono comes with the 7 hour rated "GITevo" chamios pad and these Karma's just have a 3 hour rated "MAX" pad. Somehow, in the confusion of looking at a million different bib shorts, I thought that these bibs came with the GITevo pad as well. Had I paid ATTENTION I would have DEFINITELY just bought the Tono Race Bibs. But with that being said, these Karma shorts are amazingly comfortable and I'm definitely happy with them. The thunderbike material is amazing. It somehow has compression support but without ANY restriction in range of motion. The pad is still comfy, don't get me wrong. I could immediately notice a difference on the indoor trainer ride I just finished. The straps are pretty stretching but don't really stay flat on me. They roll a little bit, but I'm also pretty tall. I'm 6'3" 198lbs and the XL fits absolutely perfect. I'd give these an 9/10, if they had the GITevo id probably give them a 10/10. I do like these shorts. Pretty good fit and good padding. Good value. These are very comfortable, well made, and fit is spot on from the sizing chart. The legs are bit longer than I'm used to though. Other than that, quality bibs for a very reasonable price.